Eventually every artist seems to draw or paint fruit. Have you noticed that? So it seems hard to call yourself an artist if you haven't brought the fruit bowl to your art table. To that end I decided to have a go at fruit this month in watercolour. I have decided to take a very loose wet in wet approach. This is so very much more achievable for me, I think, as opposed to attempting some proper sort of botanical style, or classical still life. Maybe next month. Or the month after. One of the most liberating and fun approaches I have come across is wet into wet watercolour. I'm painting fruit in this style. Here are my steps - join me! My inspiration is Andrew Geeson. I discovered him on You Tube and have been watching his videos over and over again. Watching people painting is almost as soothing as painting oneself. Actually ... in some instances it may even be better. You don't have to lift a finger and every painting turns out brilliantly.... It's painting for tired people. But please don't let that stop you getting out the paints and experiencing the tactile delights of watercolour for yourself! Time for colour. I chose to paint some red pears. So I splashed in some Lemon Yellow, then my favourite Schminke Translucent Orange and Scarlet Red. Where the water is across the pencil sketch the paint flows and runs. It's delightful to watch. You have to try it. The burst of colour is joyful, but we can do even better - with shadows. I chose Ultramarine blue and Schminke Brilliant Blue Violet. I am trying to let the brush and the water do most of the work, but it requires some restraint not to interfere. Initially I couldn't help trying to make brush strokes that go in the direction of the pear shape. This is a good thing in the ordinary course of events, but I learned towards the end of the painting that it is better to press a confident brush mark into the paper and then leave it, rather than dragging the brush around too much. I let this stage dry and then went back in with a smaller brush to add a few details. And of course a few details soon become a few more. Before long you can't help wondering if you shouldn't have stopped painting and not added any further details at all. Won't you get out your paints and join me? This month I am drawing value studies in pen. I have chosen yoga poses as my subject because I love drawing figures and I am a something of a new convert to yoga. I took a course with the lovely Julie Johnson over at the Jeanne Oliver Creative Network (a place of many lovely art classes, if you are looking...). This course is entitled Scribble Art, and was a marvellously fun way to study and practice the all important values. Here is the first one I did, Tree Pose. I loved using loose and messy scribble to bring form to this figure in a pose that is known for bringing stillness. Rather apt, it seemed. We take our messy, scribbly jumble of thoughts and emotions into yoga class, and hopefully leave with a little more stillness and calm. The second pose I tried was Warrior III. Somehow I couldn't help but add a little bit of coloured pencil. I had originally thought that I would leave these black and white - just pen and paper. But the muse suggested some subtle colour. Who am I to refuse? The third pose I tried is Upward Dog, shown at the very top of this post. My favourite so far. I can't believe I am already at the end of my flower faces series. I have to admit I am tempted to do another month of flower faces because it has been so much fun. But I already have something else in mind, so my series for June will be something a bit different from this. New medium, new surface, new subject. Exciting. Creating something every day and posting it is certainly a challenge. But a good one. After the first month, I still highly recommend it. Even though my task of creating one flower face in pen and mostly watercolour is a relatively small one, it has still been tricky to fit it in some days. And I think that is rather the point. Even a comparatively small task is easily squashed out of the day by things that seem urgent. Having promised myself (and you!) that I would post every day has helped me remember that while there are other urgent tasks in my day, this one is still important to me. It deserves its space. So my project of monthly series continues. In closing off the last of the flower face posts for this series I would like to share seven of my fave flower quotations. Which is your favourite? 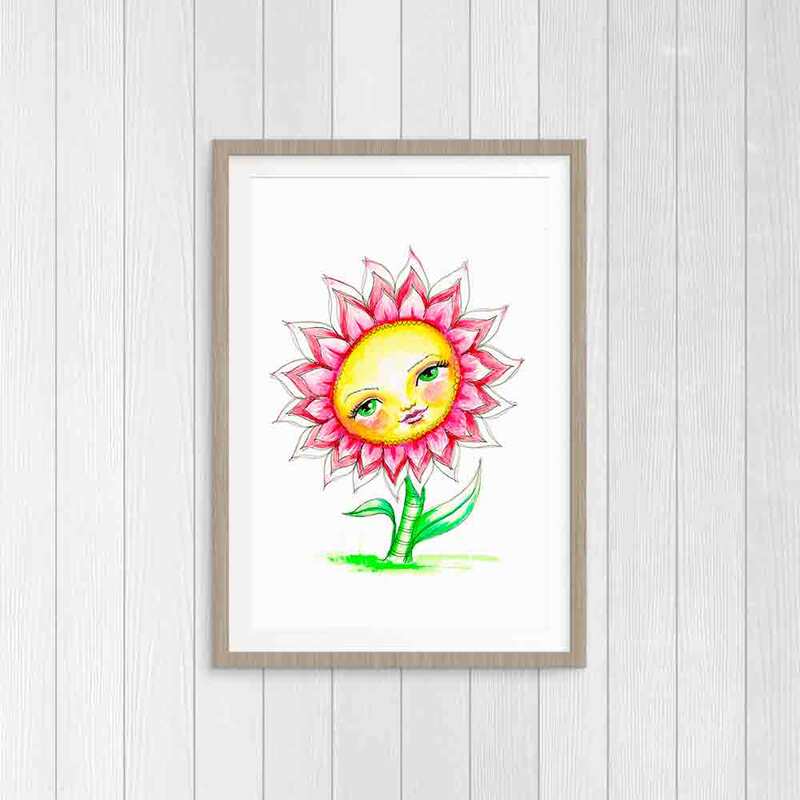 Explore more of the Flower Faces series or see if you can find your favourite in the shop. I don't think it is possible to look at daffodils and not think of Wordsworth's poem. I was going to write it out for you, but luckily Jeremy Irons is going to read it to you, most beautifully, instead. Explore more of the Flower Faces series or see the rest of the monthly series in the collection. What is the bee's favourite colour? Flowers are designed to get attention. That's probably why we love them. Those bright colours certainly can lift our spirits but they serve a very specific purpose. The point of the flower is to attract pollinators. Insects, birds and bats are all pollinators. Insect pollinators include ants, bees, beetles, butterflies and moths. Honeybees do more pollinating than any of the other insects. Purple is the bee's favourite colour. (It's mine too. Sensible bees.) Bees are attracted to purple flowers more than any other colour of flower. The honey bee aims for purple flowers for an excellent reason. Purple flowers contain more nectar than other flowers. So it makes sense that if the bee is genetically primed to seek out purple flowers they have the best chance of survival. It is a symbiotic relationship. Likewise, the flower that has the showiest purple flowers increases its chance of pollination and also improves its chance of survival. Butterflies prefer bright pink, red, orange and yellow flowers, while hummingbirds are attracted to red, fuschia, pink or purple blooms. Flowers that bloom at night tend to have less vivid colours. These flowers tend to be pollinated by bats and moths, and there is little sense in their having beautiful colours that won't be seen in the dark. Instead, these flowers are heavily fragrant, using scent to attract their pollinators, rather than colour. Interestingly, the honey bee doesn't actually see colours in the same way that we humans do. Bees see colours in ultraviolet. Primary colours to the human eye are red, green and blue. But to bees, primary colours are blue, green and ultraviolet. While the studies don't all agree on what the exact colour spectrum is through the eyes of a bee, they all agree that bees cannot see red. To a bee, red is seen as black. We have been learning about the bee's view of the world from about the early 1900's and the work of Karl von Frisch. If you are looking for more recent investigations of the sensory perception of the bee you might want to start with Lars Chittka from Queen Mary University of London. But on a more practical note... if you are wondering what colour to paint your hive..... go here! Explore more of the Flower Faces Series or see the other monthly series in the collection. Is there anything more cheerful than a bowl of Gerbera daisies? Daisies can be something of a humble, understated little flower, but the Gerbera is not easily overlooked. In fact, I think they look a little bit fancy. They come in a glorious range of bold colours and can be single, double, quilled or crested double. See....? Fancy! Gerberas come in an impressive range of vivid colours. With their beautifully large heads and thick, sturdy stems they are an excellent choice of cut flower, that lasts well in the vase. In the garden they are perennial only in the warmer climes - tough winters are too much for African beauties. All daisies are associated with innocence and purity. Gerberas have the added association of cheerfulness. But their benefits go beyond brightening one's day. They are effective at removing some chemicals from the air like the tricholorethylene that is used in dry cleaning. They also filter out formaldehyde and the benzene that comes with inks. So not only are they merry and bold, but Gerbera daisies may actually be decreasing our risks of cancer, asthma, allergies and auto immune diseases. We are probably all aware that most plants absorb carbon dioxide and give off oxygen during the day. However, unlike some other plants, Gerbera daisies continue to do so at night. This means that having a Gerbera daisy plant in your room at night can increase the level of oxygen in the room resulting in a better night's sleep. Columbia and the Netherlands are currently the largest suppliers of cut Gerberas. The Gerbera daisy is the world's fifth most favoured cut flower. In case you are now wondering, the four most popular cut flowers in the world are rose, carnation, crysanthemum and tulip, in that order. Explore more of the Flower Faces Series and the rest of the monthly series in the Collection. Yesterday I used up all the white space around my flower face with a textured background. Funny - it was only when I covered up the white space that I actually noticed that there was a lot of white space in most of the other pictures in this series. I like that they don't have to share the page with anything else. I like the white space. It reminds me that I have made time in my life to make them, and that in turn has given me a little 'white space' around myself. Each flower face sitting in its clear space seems to be saying, "Make a little time for yourself." It is so easy to have life take over and for there to be an endless stream of tasks to tick off the to do list. How often do you get to the end of a really busy day and find yourself wondering... what did I really do today? If I am not careful, the day whizzes by in a flash. Before I know it the things I would like to do - the things that are important to me, have been squeezed out. Unless you prioritise them, and set aside a specific time for them, they will be neglected into oblivion. We multi task whether we realise it or not - even if we have read many an article telling us that this is not the way to do things anymore. Our mobile devices beep and flash and vibrate with every little whimper from cyberspace. It is hard to ignore that flashing envelope icon with every new mail, or the persistence of our social media notifications. In the car at school pick up, we can be planning the evening meal, googling a recipe for it and placing an online order - all while chatting to the mum parked beside us. Whatever happened to staring calmly into space for a few moments? No, I seem to have to allocate time to be still. I don't want to say this, but it is like scheduled 'me-time'. No you see... I really want to go back and delete that. It sounds so selfish, doesn't it? But really, if we don't reign in the frenetic pace at some point - find a little white space for ourselves, we become less capable of doing everything else that we need to do. If you are wondering how to go about incorporating a little time for yourself, this article has some helpful suggestions. If you are looking for some more in depth information and guidance than an article, you might want to have a look at Cheryl Richardson's books, like this one. Sitting down with my paintbrushes and pencils is my daily white space. What is yours? Explore the rest of the Flower Faces Series. One of the things that plagues me regularly is wondering what to draw or paint. I worry that if I am not particularly inspired then perhaps I am not actually all that creative. But I am realising that inspiration is everywhere. And deep down I believe that every one of us is creative. But doubt inevitably creeps in. I think it is part of the process. And it is not so much that I am not 'inspired'. I think it is more about a fear of not being able to make something lovely out of that inspiration. So the plan is to 'feel the fear and do it anyway'. Let go of needing to make something lovely. Sometimes making something is enough in its own right. The process is often worth so much more than the final product. The other day I found an enchanting photograph of a sunflower on Instagram. I have to be honest - sunflowers are not exactly my favourites because I often see them in their later stages of life and it is that picture that unfortunately sticks in my mind. Giant stalks with bedraggled leaves. Dry and brown, heavy with seed. I am so pleased to have found a far more hopeful image which will hopefully replace the one to which my mind has been defaulting! The sunflower looked happy and hopeful and like it needed a face (currently every flower I look it seems to need a face drawn on it!). The other thing that the photo I saw inspired me to do was to use up the white space. As much as I have been enjoying the white space around my little flowers, I liked the change of dropping in a nice textured background. So much fun splashing in lots of lovely greens, extra clean water and even a bit of salt. Voila. Flower face Number 9. Choose a masterpiece that you love and copy it. Leonardo da Vinci said, " If one knows how to copy, one knows how to do". Its ok. You have permission from da Vinci. Go ahead and copy. Productively surf your social media faves.... visual cues bombard us - choose to notice which ones are speaking to your muse. You might just find a lovely picture of a sunflower to draw. Looking for more inspiration? Check out the rest of the Flower Face Series. If you set about drawing flowers, it isn't long before you hit upon a daisy. In fact, a daisy might be the very first flower that comes to mind. The daisy has been appearing in artwork for quite some time - carvings dating back as far as 3000BC depict our beloved daisy. And the daisy predates us humans by quite a considerable period. Daisies appeared shortly after the demise of the dinosaurs about 50 to 60 million years ago. I have to admit, I tend to only think of the yellow centred, white petaled variety as a daisy. That gave me pause today. I do love white flowers. But today I didn't really want to paint a white flower. I'm not sure why this troubled me at all - I am putting a face on the daisy.... Having made that leap from reality... surely the colour I choose for the petals seems neither here nor there! However, I did some research and found to my delight that the daisy comes in so very many stunning forms and colours. There are over 4000 species of daisies. Daisies are found everywhere in the world except for Antarctica. They survive in both wet and dry habitats. Daisies have a biennial life cycle, meaning they last for two years. Some of their relatives include echinacea, arnica, artichokes and endives. If you want to see some wonderful photographs and learn more about the delightful daisy head over to this rather glorious website. The daisy is said to have been Queen Victoria's favourite flower. Not only has it featured in artwork, it has inspired many a poet. Euripides, Chaucer, Shakespeare, Shelley, and Wordsworth to name just a very few. For a humble and commonly found flower, the daisy is certainly an impressively significant and enduring symbol. Explore more of the Flower Face Series and the rest of the monthly series in this project. When I started this series I worried about whether I would just create different colour versions of the same sort of doodley flower I started with. Would I come up with anything else? Enough to fill a month? It turns out that ideas come from ideas. Committing to a series is like an extended brainstorming session. If you have ever been in a corporate style brainstorming session - first of all, sorry about that - and secondly, you may have noticed that they usually begin with awkward silence. Eventually a small voice pipes up. Hmm. Some thinking ensues. Perhaps a little smirking. Then another voice. It is often easier to criticise an existing idea than come up with a new one. But funnily enough, criticising an idea is the first step to making the idea better. Or coming up with a substitute. Before long the brainstorming snowballs. From little or nothing in the beginning to multiple ideas. It's like our idea generating equipment needs warming up. When I first felt a twinge of doubt about having enough flower faces to fill a month I got out my sketchbook. Made a scratchy doodle of something that looked more like a dandelion than a flower. From there other flowers appeared in my sketchbook. Each idea a little easier to come by than the last. It is feeling increasingly wintry here in Melbourne. Lots of rain. Puddles my daughter can't resist. I think that is why I started today with big splashy puddles of watercolour. I love the willful nature of watercolour. The unpredictability that used to bother me is something I really enjoy now. I added more layers of colour. Dropped in different reds and purples. Enjoyed watching what they became. Because you never really know what you are going to get with watercolour. And what I ended up with is one of those oversized, generous blossoms like peonies or roses. I love all those layered petals and the sense of abundance they leave with me. I can't help but see little whimsical faces everywhere, even snuggled into the base of one of those blooms. I couldn't resist taking out my Derwent Inktense pencils. I like drawing into the still wet layers with them. The inktense colours are so vibrant when they meet with the water. And of course, being pencils they make small, controllable, detailed marks possible. Explore more of the Flower Faces Series and the other monthly series. Not everything you create is a masterpiece - love it anyway. Well, today I got a chance to try and do that. Not working in a series is like sentencing yourself to an eternity of first days. First days are hard. You remember them.... first day at school. First day of learning to drive. First day at a new job. Everything is unfamiliar. Awkward. A tinge of excitement for sure, but a bit uncomfortable. If you don't make art in a series then it is like giving yourself an endless stream of first days. You miss out on the chance of benefiting from the experience you gained in the last painting. I resisted the idea of working in a series for a while. It felt restrictive, limiting opportunities to explore and discover different things. The problem is that there are so very many different things to discover. If you don't stick with something, at least for a little while, you actually make it very hard to learn from what you are doing. And extra hard to avoid feeling discouraged. Its all because of the learning curve, I think. There is a theory that when you learn something new, you do the most learning at the beginning. That is the hard part. You have so much to learn that if you were to graph your learning over time it would begin with an enormously steep curve and then flatten out with experience. That steep curve is the initial up hill struggle when you are grappling with something different. When the learning curve starts to flatten out it is because you have tucked some of the basics under your belt. You have built up the necessary fundamental knowledge and skill. It was the absence of this when you started that made it feel so hard. So be kind to yourself. Make art in a series! Then I came across Elle Luna’s 100 days project over at The Great Discontent. These words really spoke to me. I had only been doing my daily journal page for a few weeks but already I knew this to be true. The muse doesn’t come and chase you down. You have to keep showing up consistently and then she can find you. Of course I signed up to #the100dayproject and today will be the 26th day out of 100 for my #100daysof10minutejournals. The point of the exercise is process and discipline. I have realised that making time to sit down and create every day has helped me so much more than the counting of the art hours that I have been doing up until now. So I am changing tack. Actually it feels more like getting back on track. What I really want is to make art. The best way to do it is to do a little bit every day. So the theme for this first month of May is flower faces. This is Flower Faces No 1. I started with books, then online courses. It’s all good. When you don’t know where to start the solution is simple…. Start anywhere! And then for the last year or two I have noticed that I only tended to do artwork from online classes - assigned tasks if you will. Now I want to do something that has nothing to do with anyone’s class. (I’m a classaholic, so I won't be giving that up) but I am challenging myself to make something every day, Monday to Friday and post it here. I am picking a different theme for each month. Explore more of this series of Flower Faces. Visit the shop to see if you can find your favourite from the series.